The Marvel Collectibles Captain America Action Statue by Bowen Designs is now available! Captain America, Marvel’s Living Legend, was introduced to the shared Marvel Universe in Avengers #4 (1964). Though he had been created nearly 25 years prior, his character had not been published for a few years. When the Marvel Super-Heroes began gaining popularity in early 60s, many of the company’s older characters were revived for the new era. 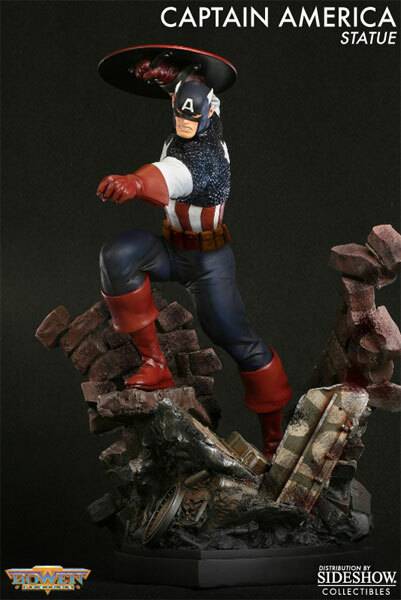 This Bowen Designs statue shows Captain America in action, climbing rubble and throwing a punch at evil. It is sculpted by Randy Bowen and stands 14″ tall. Some of the bricks in the statue are removable. Sling your shield over to Amazon and order the Marvel Collectibles Captain America Action Statue today!